your so right we will never forget! I was a freshman in high school. I was the first student to walk into Mr. Cole's 2nd Period Earth Science class and he was watching something on the TV and I casually asked "Watcha' watchin'?" I don't remember how he answered, but all we did that whole day was watch the TV. I was in high school too... our history teacher turned on the TV and let us watch CNN. Still gives me chills. I wrote a little post on my blog about where I was and how I felt that day 10 years ago. Somethings change you forever. I was at home, but my husband and I (we were friends at the time) had been in New York visiting a friend a few months before. And I remember being so horrified. It was hard for me to write about this year...it seems like yesterday. I was in my classroom. My students were in the library, so I was able to pull it up on the internet in order to see what was happening. Horrific is an appropriate word, just absolute Shock! after working in downtown manhattan, seeing pictures like that enforce even more the insanity and devastation people working there must have felt. absolutely unreal. You are making me feel old!! I was hanging out with my sister and our kids when her husband called from work and told us what had happened! at school too. 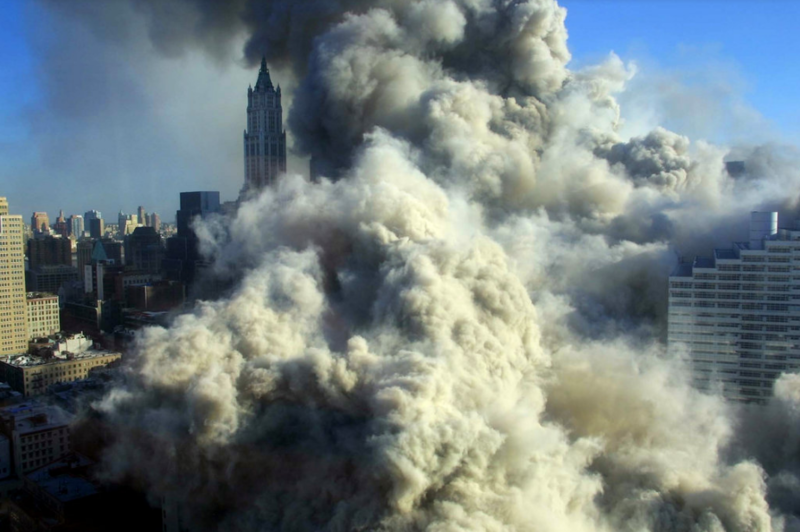 in history class... we turned on the TV and watched the second tower get hit. Walking through the halls that day was completely solemn, everyone was quiet. it really doesn't seem like 10 years ago. I was 18 years old. I moved out RIGHT after graduation to live in an apt with my high school sweetheart. I was working at a Limited Too in the mall in Albany, GA & I was on my way to work. I cranked up my car and heard news on the radio so I immediately started switching stations & EVERY station was news so I got fed up and just left it on my favorite station. It was then that I heard them recap that a plane had flown into the WTC. I thought "WHAT? What kind of idiot flies right into a HUGE building like that?" And then as I was about 5 minutes from my apartment I heard them say "OH MY GOD." And then announce that a 2nd plane hit the other building. I have never in my life felt chills that intense from head to toe. I started crying but went to work. We listened to the radio for another hour.. heard about the Pentagon.. heard the first building fall & then our mall in a tiny GA town closed down and sent us home. I spent the day with my boyfriend & best friend crying about what was happening on the TV in front of us. I found out the next day that my high school art teacher lost a son on the 104th floor of Tower Two. I was sleeping at my apartment in Santa Cruz, when my Dad called and woke me up, saying that we were under attack. I woke up my roommate and I remember us just sitting in silence watching the television for hours. Still hard to believe looking back on those reports. I don't remember what I was doing but I do remember reading the tragedy and all the sad stories. My heart goes out to all who lost their loved ones and the brave rescuers, especially those who contacted cancer due to the smoke inhalation. I remember it like it was yesterday! I was 13, and I was up early getting ready for school in Australia. My radio station was on that I listened to every day and one of the presenters happened to be from America. I remember being really attentive to them talking as they were sounding so sad and had rung the presenters family in the U.S to check they were ok. I walked out to my mum who was in the kitchen and said I thought something was really wrong. There was something wrong in the U.S and it had something to do with planes. Mum ran over to the tv and turned it on and just as she did the footage screamed to life of the first tower falling. I remember sitting on the floor with my mum glued to the tv for the rest of the day crying and crying. The whole of Australia was sending love and kind thoughts to you all yesterday. I was in grade school then. We saw the news on television. Unforgettable day and sad as well. I wrote a post about it too. I was in high school. Sophomore year. Our principal came over the intercom right before 3rd period. I was in college. I could see the smoke from my dorm window on Long Island, NY. It was and always will be unforgettable and sad. I'll never forget that day either. I was in the shower, getting ready for my college Political Science class. I heard it on the radio, and thought it was a terrible joke. I turned the tv on in time to see the 2nd plane hit. Devastating. I remember the events of 9/11 like it was yesterday; can't believe it's been 10 years. I was in 5th grade and saw it on TV five minutes before I walked out of the door to go to school...then I remember such a somber feeling at school when I actually realized what happened. I can't believe it's been ten years, but it is so important to remember it and be grateful for what we have!